EgmontUSA has decided to give Shadow Hills by Anastasia Hopcus a new look for its paperback release! The Shadow Hills Street Team is releasing the new cover piece be piece from November 8th to the 19th. Each blog will also have Shadow Hills trivia questions. On November 20, Anastasia will reveal the entire cover and the answers to the questions. Those trivia questions are your way of being entered to win a signed Shadow Hills poster - get the answer correct and you're entered to win one of 24 posters. That means that you have 24 chances to win, because you can answer both questions each day of the reveal! So make sure to follow along and eneter at each stop. Make sure to visit Ramblings of a Teenage Bookworm and Sophistikatied Reviews to see yesterday's puzzle piece and trivia questions. 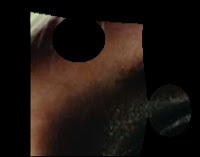 Tomorrow's puzzle piece and questions will be at Ticket to Anywhere and Reading Angel. If more than one person answers the question correctly, random.org will be used to determine the winner for this stop. Make sure to check Anastasia's blog on November 20 for the official paperback cover reveal! For more information you can check out Ms. Hopcus' website, twitter and the Shadow Hills Facebook Page.